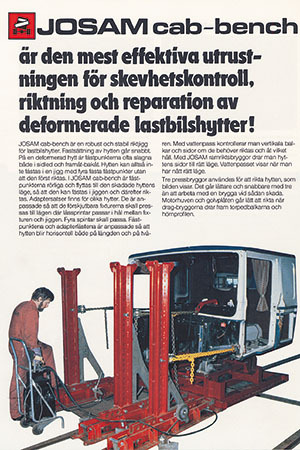 JOSAM is located in Örebro, Sweden, and part of the Car-O-Liner Group. 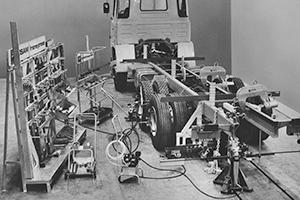 Ever since we invented our first frame straightening system in 1972 and our first wheel alignment system in 1974, we have been dedicated to improving our products to higher levels of speed, accuracy and user-friendliness. Today you will find our products on six continents. Our wheel alignment systems ensure correct axle and wheel alignment, which reduces both fuel consumption and tyre wear. It also improves driving safety and comfort. JOSAM’s wheel alignment systems are used all over the world by OEM workshops, independent workshops, fleet owners and tyre workshops. We strive to serve workshops with products that can improve their profitability and make their customers even more satisfied. The JOSAM straightening equipment makes it possible to effectively and qualitatively repair damage to vehicle frames and chassis instead of replacing these components. This means that there is a significant economic advantage for all concerned. Training for users of JOSAM products is another core activity. Through this training, clients get access to the latest methods for wheel alignment and straightening, as well as effective utilization of the equipment. In addition, to make training available to technicians, we offer training programs for service personnel and insurance claims adjusters. We strive to be the global leader in workshop solutions for heavy vehicle wheel alignment, repair and maintenance ― through our conceptual, technical and information knowledge. By enabling trucks and buses to save fuel and tyres, we contribute to a better environment. Whenever our customers use JOSAM’s straightening equipment to extend the lifecycle of a heavy vehicle, we contribute to greater durability for the entire industry. We promote environmental consciousness at all levels of our administrative and technical departments and work systematically to make continual improvements in this area. The administration of environmental impact systems are certified according to ISO 14001. Through our extensive experience and well-developed client contacts, we are constantly improving our products. New material and technology are being introduced on a continuous basis so as to be able to offer clients the most effective equipment and techniques possible. The new product concepts and methods are then tested in our own measurement and straightening workshops. We promote quality at all levels of our administrative and technical departments and work systematically to make continual improvements in this area. The administration of quality control impact systems are certified according to ISO 9001. JOSAM is represented in most countries on allcontinents through our affiliated companies and representatives. In Sweden, China, Thailand and United Arab Emirates there are training centers that offer training to clients and others within the branch. The company was founded and the first straightening press for trucks is ready for sale. Unlike other press trolleys, the Josam straightening press is anchored in the floor beams in the workshop. The next stage of development involves a new alignment system for truck wheels and axles which is named JOSAM laser AM. 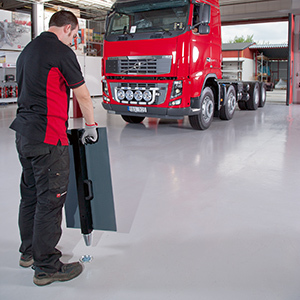 This system is based on the idea of using the centre line of the truck frame as a reference when aligning wheels and axles using lasers and alignment scales. The JOSAM cab bench sees the light of day. This time, the team has managed to devise a completely new system for straightening truck cabs. Ingeniously, this system can be supplemented with various adapters so that it can be used with different makes of trucks. In the beginning of the 80s, Josam is growing at a tremendous speed. 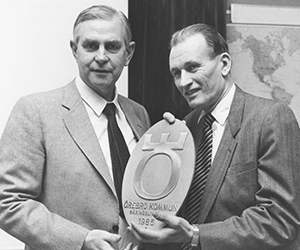 In 1985, Josam was given the Industry Award by the Municipality of Örebro. Here, a proud Jonas Samuelsson (Josam founder) can be seen accepting the award from councillor Axel Gisslén. In 1995 Josam becomes ISO 9001 certified. 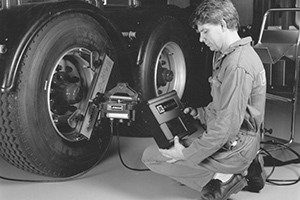 1996 sees the introduction of the truck aligner, JOSAM truckaligner I, a wheel alignment system based on electronics instead of an analogue system. 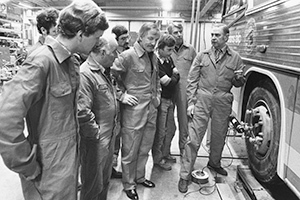 In 1998, the first induction heating system is released. A new cab straightening system with floor anchoring, JOSAM cab tower, is launched in 2002. 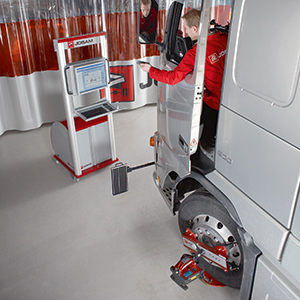 The PC based wheel alignment system JOSAM truckaligner II is released in 2006 and the new frame straightening system I-press is introduced in 2008. The super fast wheel alignment system JOSAM i-track is released. 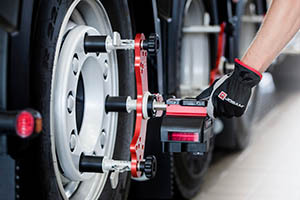 I-track means you do not have to apply scales to the vehicle itself, so in turn you can measure the wheel alignment and diagnose the wheel settings very quickly. 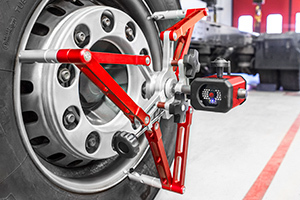 2014 sees the introduction of a new wheel alignment system based on camera technology. With the robust and mobile JOSAM cam-aligner system, wheel alignment can easily be performed in any place and in any environment. The highly successful wheel alignment system JOSAM i-track is released. With I-track II, the best has been made even better.